Adult education teachers are always looking for ways to reach their students with math instruction that works. Many times, the issue with students is a lack of math confidence as much as a lack of math skills. A few resources identified in the newsletter below will address both of these topics. Under "Teaching Tips and Resources," learn about ways that real teachers are presenting real-world math strategies to their students. Also, see how a program in California is harnessing the power of students' smartphones to present math instruction through an app. Many adult students struggle to confidently perform the math skills required for their goals, but with a new resource in hand, perhaps you can help them in a new way. Every teacher has been asked while teaching a math skill, "When will we ever use this?" Even though it may not seem like it to students, even adult students, we do use math in everyday life. 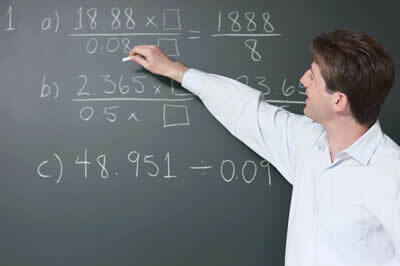 Edutopia has compiled a list of real-world math strategies collected from real math teachers. Titled 7 Real World Math Strategies , this article has several ideas that can be easily adapted for an adult education classroom. Writing skills will be crucial for our students in their college and career futures. There are a lot of ways to teach writing skills. Edutopia's article Double-Duty Writing Instruction shows how some writing instruction strategies can also teach another important life and professional skill: empathy. Having students read and edit essays by others to help them relate to someone else's point of view or read a poem that inspires empathy for others are just two ideas from this article. With no computer lab available, the UMI Learning Center in San Diego, CA relies solely on students' smartphones to provide math resources. They make use of the Learning Upgrade App with its 600 math lessons and 300 English reading lessons, all aligned to the CCRS standards. A recent post from EdTech Center provides more information about the UMI Learning Center and why they have been named as a finalist for the Adult Literacy XPRIZE. The online tool GED® Flash for Organizations can help your students prepare for and pass the GED® exams. Students can be assigned practice questions for any of the four GED® test subjects and teachers can see their scores and track their time. Through August 31, you can get 14 months of GED Flash at the 12-mon th price and get GED Ready® practice tests for $2 each per GED F lash seat. Learn more online . Educational Testing Service (ETS ) and the HiSET® exam now have a Facebook page that educators and test takers can like and follow to find test preparation strategies, tips, and resources. Learn more online. Mini grants are now available for anyone who would like to attend the 2019 PAACE Conference but does not have the funds. Through a $15,000 Dollar General Literacy Foundation grant, PAACE is able to offer $350 mini grants for 18 tutors, 8 teachers, and 8 administrators. If you are interested, you can apply online . A webinar will be held on Thursday, September 13, 2018, 1:00-2:30PM, titled Meeting the Workforce Challenges of the Water Sector: A Competency Model Approach . Join in to hear how the National Rural Water Association used the competency model to address its workforce challenges. By understanding this real-world application of the Water and Wastewater Competency Model, you can gain insight into how the competency model could be used for your needs. On Wednesday, September 12, 2018, 1:00-2:30PM, a webinar will be held to discuss the Ticket to Work program, as well as how this program fits into the goals of the Workforce Innovation and Opportunity Act (WIOA). Titled Ticket to Work Program: An Aligned Mission with WIOA , this webinar will present both a broad perspective on what Ticket to Work is and how it can be used by your agency, as well as an in depth look at what this program looks like in action from agencies who are using it. The blog GetEdFunding.com recently shared a list of funding opportunities aimed at summer activities; however, most of the grants listed accept applications year-round. It is important to include valuable data in any grant proposal, but there are other ways to show the value of your ideas. A recent post from GetEdFunding.com, titled Adding Value to Your Grant Proposal, emphasizes ideas such as showing who will benefit from your proposal and showing how the funder will benefit.